This very attractive, beige-brick apartment building was erected in 1912 and converted to a cooperative in 1993. The 12-story structure has 47 units. The building has handsome wrought-iron balconies and entrance doors and a canopied entrance. It has consistent fenestration and sidewalk landscaping. It has an excellent location that is convenient to public transportation, shopping and many restaurants. 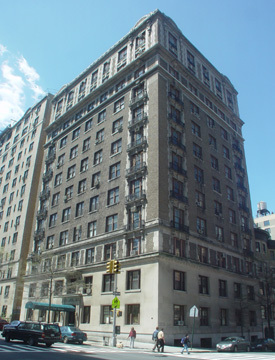 It is one block from Riverside Park and close to the Collegiate School, one of the city's finest, across the avenue.